After years of consistent growth, Tolco Corporation, a Toledo-based trigger sprayer manufacturer, outgrew its existing facilities and needed more space – not just to meet current customer needs, but to plan for the future. 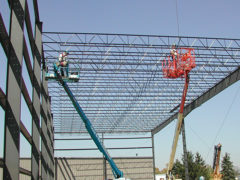 The solution was Tolco’s first purpose-built addition and largest-ever expansion, a 17,000-square-foot Varco-Pruden pre-engineered steel warehouse. Tolco selected Rudolph Libbe Inc. and its Special Accounts team to serve as general contractor, with our own craftspeople self-performing site work, concrete, masonry and carpentry. The fast-track project was completed in six months within tight constraints across the street from Tolco’s downtown Toledo headquarters. The expansion allowed Tolco to bring outsourced work and materials back home to downtown Toledo and hire more staff. We have more room for staging orders and quality control inspections. We streamlined our operational processes, allowing us to do things better and smarter. If we get a big order out of the blue, it’s a lot easier to take care of the customer from here with more inventory on the floor.